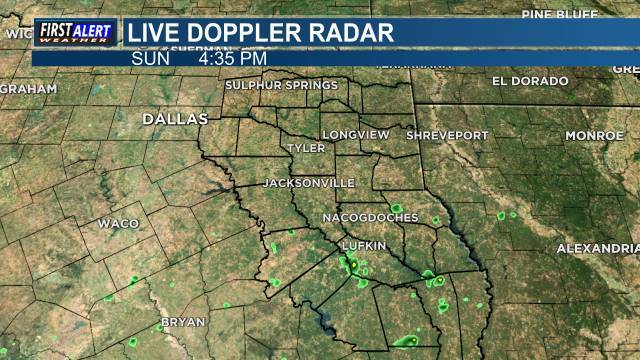 East Texas (KLTV) - Here is the Weather Where You Live... If your skies have not completely cleared yet tonight, they should very shortly. Great, spring-like, weather is expected for our Thursday and Friday. Cool mornings and mild afternoons with plentiful sunshine. Increasing chances on Saturday with rain chances slowly increasing through the day. A fair chance for more showers and thundershowers again on Sunday/into Monday morning as another cold front slides through. Once the front passes on Monday morning, skies should slowly clear with a pair of nice days ahead on Tuesday and Wednesday. Temperatures through Friday should be cool in the mornings and mild during the afternoon hours. Mild conditions are then expected Saturday through Wednesday. Welcome to Spring 2019!! !